Lately I have finished a lot of things. In other words, I have a bunch of things on my dunzo list which should definitely be spelled 'donezo' considering it's based on the word 'done,' but apparently this nonsensical word is also spelled nonsensically. Except, unlike Tom's list, mine are all good things! First up: the Woodland Gable wrap. 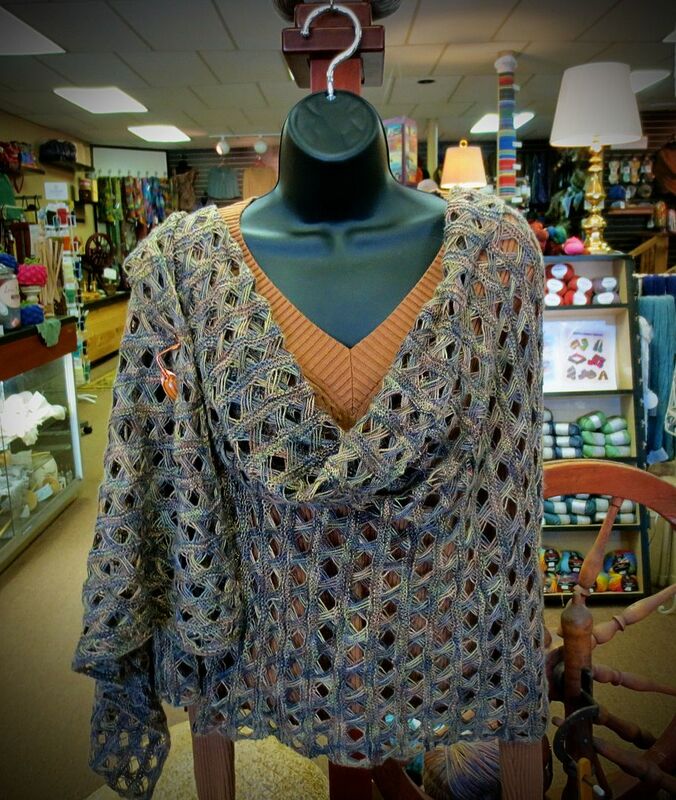 Here it is, on display in my local yarn shop. I'm so pleased with how it turned out-- and it's absolutely enormous! As it should be, considering that there's nearly a mile of yarn in this wrap. My LYS owner, Jan, did a gorgeous job of displaying the wrap, of course. She has such an eye for visual merchandising. Next on the dunzo list: the Bonjour, Girl socks! Ta-da! These are the softest, coziest socks in the world (or at least in my sock drawer. Close enough.). 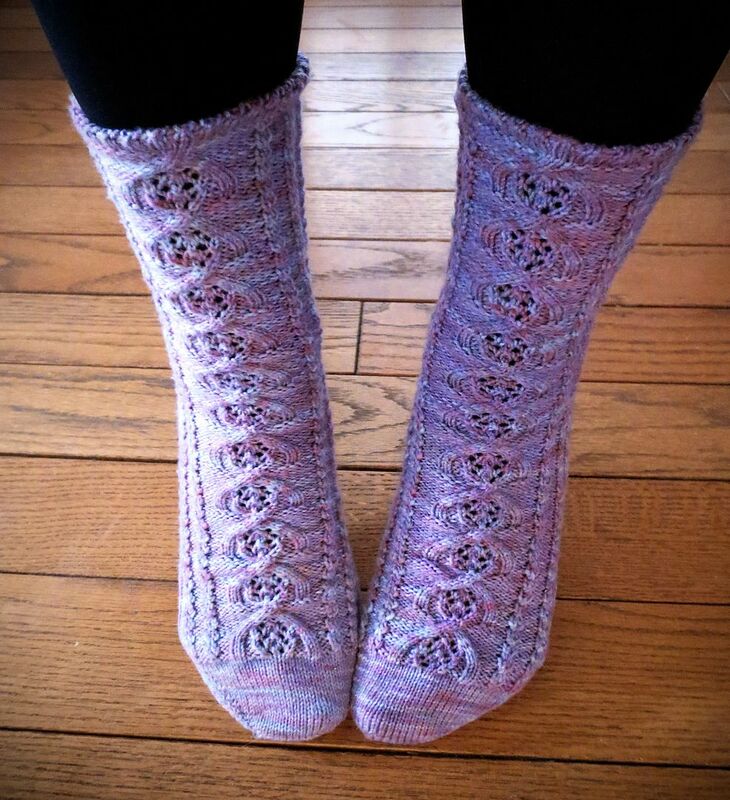 I love the cable and lace pattern on the front of the socks, but fair warning: the heel instructions for this pattern are a little bit questionable. After some research, I think the problem is the instructions for doing wrap and turn short rows. In short, this pattern instructs the knitter to start wrapping the stitch before slipping it to the left needle, so the stitch ends up being on the wrong side of the wrap when you go to knit them together. At first I thought it was just that this was my first time turning heels, but it looks like other people on Ravelry have had the same issue with this pattern. As long as you know to look out for it, and use alternate wrap and turn instructions, I think you'd be okay knitting this pattern. For more details on other modifications I made to this pattern, check out my Ravelry project page. Lastly, I'm dunzo with reading The Monsters of Templeton by Lauren Groff (which still looks exactly the same, so no photograph of that.). Overall, it was a satisfying read. One rather major plot point came to a conclusion that felt like a bit of a cop-out to me, but in general, I was happy with the way things turned out. How's that for vague and mysterious? And if they invited me, I would totally go play putt-putt with anything on it. 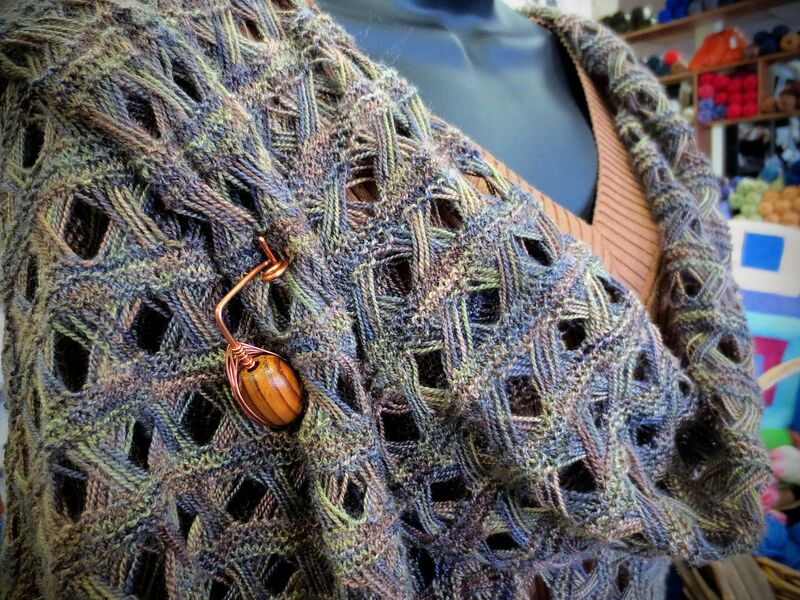 The scale of some of the projects you work with simply blows me away, you are such a talented knitter and I love getting to see your latest work of art. I'm sure that your wrap is going to be admired by everyone that walks in the shop! And you've finished a celebratory pair of socks? Perfect! Oh my goodness, Ivy-- you are the sweetest, thank you so much! I'm just as inspired by your work. I'm hoping to knit my first sweater soon, and seeing your Evergreen was so motivational! Thank you so much, Marie! Tom is my favorite-- his facial expressions are just great. And I have the same experience going to your blog! You make me want to cast on a plethora of shawlettes, hats, adorable little toys-- and pretty much everything else you knit! I hope you are feeling proud of yourself, both are such gorgeous pieces! I couldn't bear to give something I had been working on that long back to a shop for display. I seriously love the socks too, anything that's pink appeals to me! I was thinking about giving them a go but after reading about the pattern issue I don't think I am up to that yet. Thank you so much! It was so exciting to get both pieces off the needles. Suddenly the only thing I was working on was my Beekeeper's Quilt! The sock pattern honestly wasn't too bad once I figured out that it was a problem with the instructions and not with my knitting, after trying over and over to get the right stitch count for the heel. But since it didn't interfere with the cabled, lacy section, it wasn't too much of a problem, as I would have needed to adjust for the eye of partridge heel anyway. Overall, I would say the socks were worth the figuring out. Feel free to use my Rav notes if you do decide to knit them!